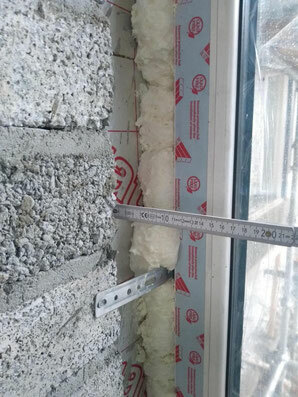 I came across with plenty messy window installations here in Ireland so far and I´m still missing any standard for the appropriate installation of windows, as known from other European countries. Another shocking detail is pictured in the photo beside. The window was measured too tight (as always) and that´s why the installer were shifting the cavity wall closer further back into the cavity. In this case for almost 50mm. This is definitely the wrong attitude, because the void, they created in front of the cavity wall closer, needs to be insulated as well. The beads won´t get access there, because they´re blocked by the closer. I highly recommend to fill such gaps before starting window taping, to prevent thermal bridging and cold spots in the building structure. I´d love to see more educated window reps and installers in the future, taking attention to those important details. Unfortunately not every window company is equipped with the professionals, you can trust.